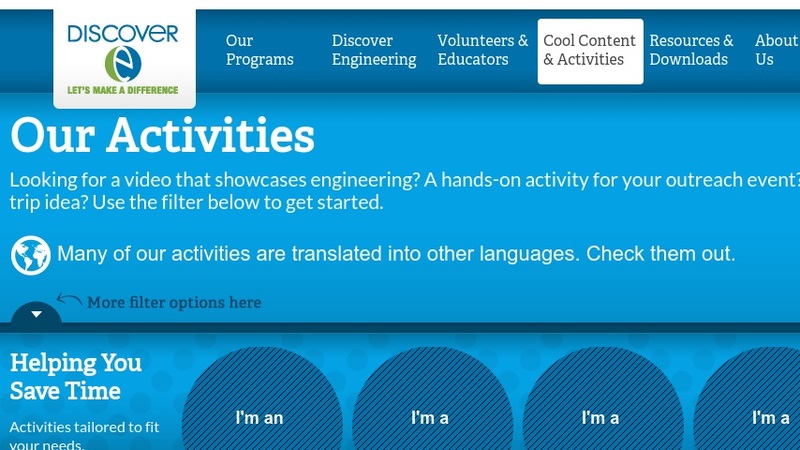 This website is designed to introduce kids to engineering. It includes a section with brief career profiles of various engineering career paths, but the real fun is in the videos. Featuring kids engaged in activities that illuminate key concepts in engineering, these videos showcase the work of engineering in a dynamic and exciting format. For example, one video covers the biomechanics of skateboarding -- taking real kids on a field trip to the Etnies Shoes headquarters where they learn how engineers (who are also skateboarders) use science to design shoes that help absorb impact and minimize injury. Another video takes a group of kids to Disney World to experience how Disney engineers transform potential energy into thrilling roller coaster rides. All of the videos feature a related hands-on activity to let students apply the science concepts involved. Editor's Note: Don't miss the section "Cool Stuff" for games and activities that help students connect the science principles with engineering practice. For easy downloading or full-screen viewing, see Related Materials for a link to the You Tube version of the roller coaster video.